Abstract: The Albatron GeForceFX 5200P is oriented towards budget gamers who want the latest and greatest in terms of technology but do not need the $500-levels of performance the other nVidia cards offer. nVIDIA received a lot of flak when they released the GeForce4 MX GPU last year, many screamed that the GPU while fast, did not deserve the GeForce4 nomenclature since it was not DirectX 8 compatible. It seems like nVIDIA learned from their mistakes this time around because the entire GeForceFX line of GPU's are DirectX 9 compatible - even the budget GeForceFX 5200 based Albatron videocard we're testing today! Based on the NV34 core (and despite the higher core code), the GeForceFX 5200 is slower then the NV30/FX 5800 and NV31/FX5600 cores. With only 47 million transistors, the GeForceFX 5200 core has less then half of the transistors of the flagship GeForceFX 5800 (125 million) and only about a third less then the GeForceFX 5600 (75 million) core. Heck even the GeForce4 Ti's had a transistor count of 63 million. nVIDIA also use the more mature (and less expensive) 0.15 micron manufacturing process for the GeForceFX 5200 class cards instead of 0.13 micron for the FX 5600, FX5800's. 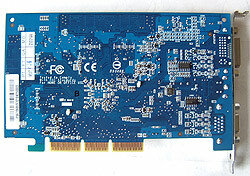 Using a cool coloured blue PCB, the Albatron GeForceFX 5200P is oriented towards budget gamers who want the latest and greatest in terms of technology but do not need the $500-levels of performance the other nVidia cards offer. 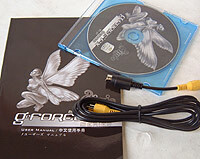 With a street price of just $155 CDN ($95 US) the Albatron GeForceFX 5200P does not come with any other frills other then TV-Output and WinDVD. With no DirectX 9 games on the market, it was a wise move for Albatron not to bundle any games with the videocard since the older games would just tack on to the overall price. Using the nVIDIA reference design, the Albatron GeForceFX 5200P has a small passive heatsink flanked by eight Samsung 4ns TSOP-II DRAM for a total of 128MB memory. Passive heatsinks equal totally silent videocards, so if you're looking to quiet down a computer they are a good option. 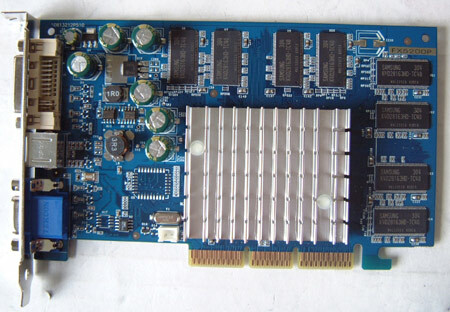 If you want to attach a 3rd party heatsink, there's a two pin fan connector on the PCB of the videocard and the mounting holes are not as far apart as on the GeForce4 line of videocards. Because this is nVIDIA's budget GPU we're not going to dwell on the performance enhancements with the more expensive cards. The NV34/GeForceFX 5200 GPU is fully DirectX 9 compliant like the rest of the GeForceFX family and according to nVIDIA the NV34 is the NV31 (GeForceFX 5600) on a larger die (0.15 micron as opposed to 0.13 for the faster GPU's) operating at a slower clock speed. Pg 12. How does the Albatron GFX5200P fare?